Join in the fun at the next Horizon Women Present… as we kick-off a summer series entitled, Captivated: Works of the Great Masters Inspired by Bible Narratives. The evening will begin at Horizon with conversation and connection as we enjoy dessert and refreshments together. 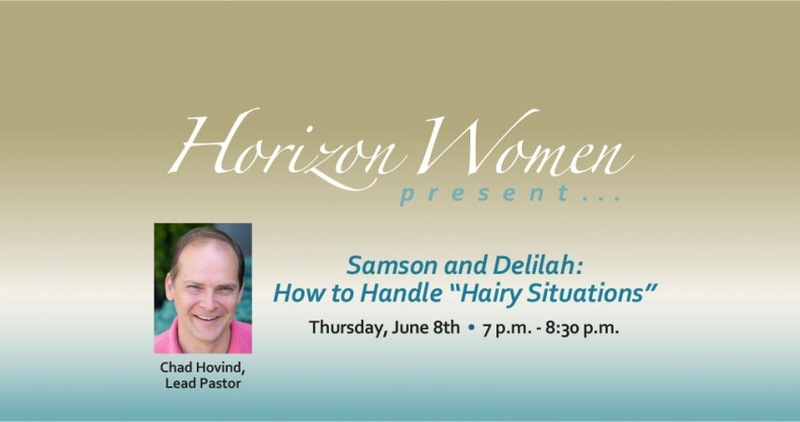 Chad Hovind, Lead Pastor, will deliver a message entitled, Samson and Delilah: How to Handle "Hairy Situations." His discussion will be based on the narrative about Samson and Delilah found in Judges Chapter 16 in the Bible’s Old Testament. This is also the inspiration for the painting found at the Cincinnati Art Museum entitled, Samson and Delilah by Peter Paul Rubens. We’ll be enlightened with a brief discussion about the history and interpretation of this work of art from a museum docent. The evening will be coupled with music and more! $15 per person includes dessert, refreshments and wine. Casual attire is suggested. The Horizon Women Present... June 8th kick-off event will be held at Horizon. Captivated: Thursdays, 11 a.m.-12 p.m.
Captivated: Thursdays, 6 p.m.-7 p.m.
$15 per person includes dessert, refreshments and wine.